When Clarus first approached us, they had a clear idea of the problem they wanted to solve. Managing after-hours calls presented a pain point for many healthcare practices, often requiring expensive contracts in exchange for inconsistent results. Clarus wanted to create a better alternative - an affordable, reliable application designed specifically for healthcare call management - and they needed an experienced development team to help them execute that vision. Our initial partnership with Clarus focused on building a web application for managing inbound patient calls and notifying healthcare providers. Over time, that collaboration evolved to meet new challenges Clarus encountered. We now support an array of apps designed to handle many facets of call management. Each application we’ve developed for Clarus presented a different set of challenges, and we’ve utilized a wide range of technologies to solve those challenges. For apps that prioritized stability and maintainability, we used PHP/Laravel and AngularJs. For mobile apps, we used Android and iOS to ensure optimal performance and a rich look and feel, and for apps that required rapid iteration, we used the Ionic framework and EmberJs. All applications are architected and hosted in accordance with HIPAA compliance guidelines. Each application we’ve built for Clarus was designed with specific needs in mind. Our iOS and Android apps give physicians with busy schedules targeted insight into their patients, notifying them of urgent contact and giving them an portal through which to respond quickly. For office managers, the web dashboard puts their organization’s data at their fingertips. 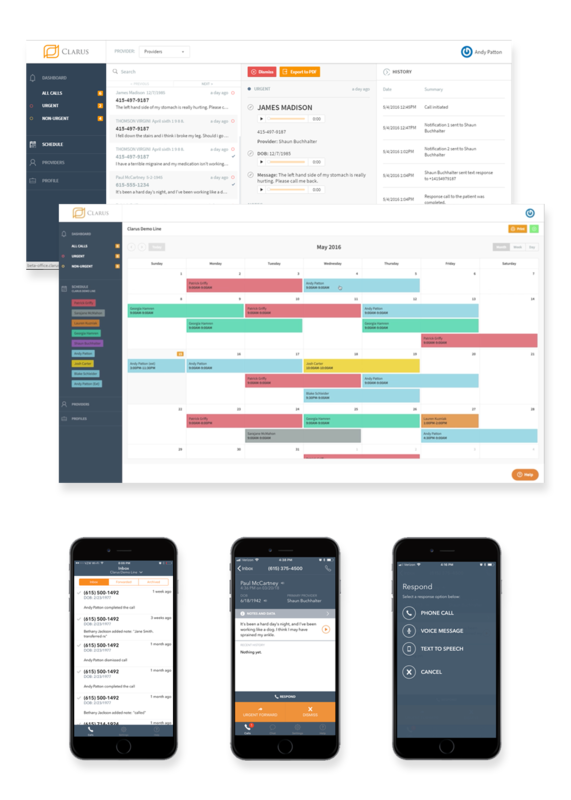 We designed a clean, uniform interface to make data simple to find in just a few clicks, whether the task is managing call records or updating the office’s on-call schedule. We helped Clarus grow their vision into a constellation of applications that supports over 300 organizations and over 2,500 users. By designing and architecting the original Clarus app with an eye to the future, we’ve been able to iterate and add to the tool quickly and effectively, meeting each new challenge Clarus faces without breaking stride. We are thrilled to see Clarus succeed, knowing that each call handled by the apps we’ve built represents a patient better able to connect with the healthcare resources they need.